​There were approximately 210 people from the Story City area that served in the military during World War One. Of those 210, eleven men lost their lives while in service. Throughout 2018, the Historical Society will be paying tribute to these eleven soldiers in the Herald on the 100th anniversary of their death. The eleventh soldier from the Story City area who died was Kornelius Tvedt on November 29, 1918. Kornelius Tvedt was born near Bergen, Norway on January 24, 1893. Kornelius was the son of Christian Tvedt who lived in Manger, Norway. According to passenger arrival records, Kornelius immigrated to the United States in 1911 with a final destination of Story City, Iowa. His brother Sigurd Tvedt was already living in this area. On his 1917 draft registration card, Kornelius listed farm laborer as his occupation and he was employed by Andreas Braland in Hamilton County. Kornelius was drafted in June of 1918 and inducted at Webster City on June 28th. In the July 1, 1918 edition of the Webster City Freeman newspaper, an article was printed describing the farewell the community gave the 32 men heading to Camp Dodge. At noon at the Elks Club the men were given a large meal and then in the afternoon they were escorted to the train station by the Webster City Military Band and many family and friends. It was reported in the local newspapers that Kornelius had received a furlough and was visiting with friends and relatives both in August and October of 1918. 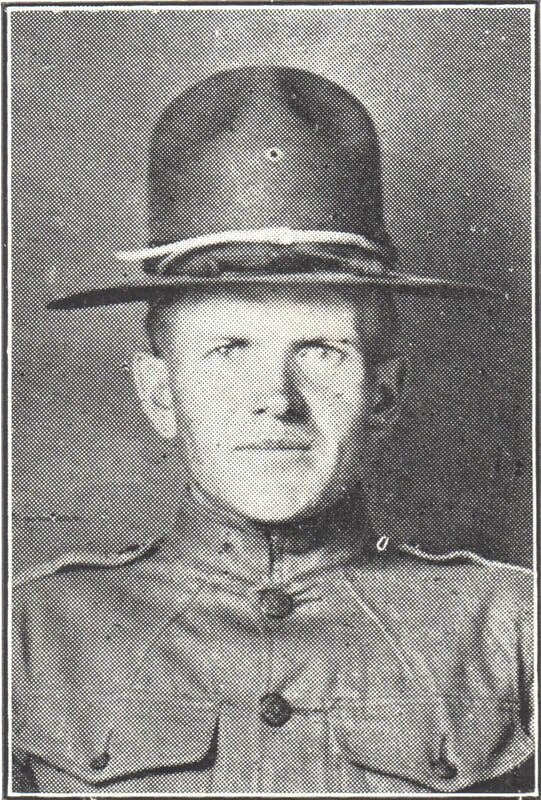 The December 5, 1918 edition of the Story City Herald reported his death which occurred on November 29th at Camp Dodge. “He was a fine young man, and had made good at the camp up to the time he was taken sick. His name will go on the roll of honor of the boys from this place who paid the last big price of our military victory.” Kornelius had died from pneumonia following an attack of the flu. The funeral was held at the home of A.E. Braland northeast of Story City on December 11th. Reverend Paulsrud officiated and Kornelius was laid to rest at Mamrelund Cemetery east of Randall, Iowa. As we remember Kornelius Tvedt and all of our Gold Star soldiers throughout this year, let us not forget that they gave their all for liberty and peace.